How important is Yoga for children with asthma? Nearly 9 million children in the United States suffer from asthma, and studies have shown that Yoga can make it easier for them to cope with the illness. Asthma is a chronic condition that triggers inflammation in the airways, causing symptoms such as coughing, wheezing, difficulty with breathing, and tightness in the chest. Due to the fact that children have smaller airways than adults, their asthma attacks are often more serious. • Yoga training fights stress and increases awareness by relaxing the mind and the body. As children learn to recognize the physical and emotional feelings that trigger asthma attacks, they gain a feeling of control and confidence. • Yogic breathing, or pranayama, teaches children how to use their rib cage, chest, diaphragm, throat, and nasal cavity to bring oxygen into the body and to release harmful carbon dioxide. Proper breathing techniques make the lungs stronger and more efficient. • Due to the fact that exercise can trigger asthma attacks, physical exertion puts children at risk. 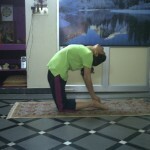 Hatha Yoga is a safe way for them to get exercise and stay in shape. • Yoga allows kids to engage in physical movement with their peers – a pursuit that is often unsafe with traditional group activities. • Backbending postures, such as Cow Pose and Camel Pose, help to open the chest and stabilize breathing. They also help to clear mucous from the airways and are easy for children to do. • Twists encourage good posture by “unlocking” the spine and increasing flexibility. They also help to massage the organs and tone muscles. • Poses that synchronize breath and movement, such as Mountain Pose and a Swan Dive, teach awareness and balance. • Yogic breathing, often practiced while in Savasana (Corpse Pose), quiets the mind and body while teaching breath control. According to statistics from the US Department of Health and Human Services, children miss 10 million school days every year, because of asthma, and the cost of medical care is staggering. As researchers work to find the reason for the astounding increase in kids diagnosed with the disease, Yoga appears to be one of the most effective complements to standard medical treatments. Gentle breathing exercises and postures that are held give children with asthma a strong sense of empowerment, as they gain muscular strength, coordination, flexibility, and self-confidence. Children need to socialize with other children in a nurturing environment. For these reasons, Yoga for children with asthma makes perfect sense. Yoga appears to be one of the most effective complements to standard medical treatments for children with asthma. Thanks for nice posting. Children need to socialize with other children in a nurturing environment. For these reasons, Yoga for children with asthma makes perfect sense. Thanks for sharing this valuable post.